It took me a few years, but I think I have finally come to understand the onion family. I now get their germination, growth patterns, nutritional needs, and their preferred storage temperature. I also “get” their propagation. Behold: the best of the best of last year’s yellow storage onions (Copra, in case you’re curious). Instead of gracing some savory dish, I want their seeds! I’ve done quite a treatise on onions before. We take a many-pronged approach to this wonderful vegetable, and don’t “just” eat storage onions all year; I reserve their exclusive use for the depths of winter. But storage onions are important. So I select the heaviest, non-sprouting, biggest ones to save for seed-making. These three are actually from seed saved here, so they’re obviously well-adapted to the rigors of the clay soil and the relative neglect that is storage in my root cellar. And here they are, shining on a day in May. Simply placing them up to their shoulders in the dirt, I wait for them to sprout. They’re in the back of a bed: their seedheads can get quite tall (one in the greenhouse from a red storage onion is now over 5′) and let them do their thing. I will harvest the seedheads when they look kind of dry. When fully dry, they’ll get shaken over a white pillowcase and then the little black seeds will go into an envelope, waiting for next year’s seedling season to sprout anew. Thank You! I have been thinking that I’m some kind of onion idiot…..I have just pulled 3 onions that have been in the ground over one full year….I am comforted to know that you’ve been working with them for some time to get to know them. Last spring, I planted some ‘Candy’ onions that are supposed to be ready in 80 days…..still nothing but a skinny green onion. This is one full year in the ground! Conversely, some onions that I planted this winter/spring are starting to bulb up. I imagine it’s my really crappy soil that is to blame. It’s now better soil, maybe that’s why the improved growth of the onions. I had nearly decided to give up, until I read this post. There is no onion as good as one straight from the garden (according to the one I’ve had so far in my whole life)…. Petunia, one thing I have learned is that many onions are day-sensitive so they bulb up and peak when there are the most hours of daylight. The ones that are grown in the north here are called “long-day” onions in that we get around 13-15 hours of daylight around the summer solstice, which is prime bulbing time. In the south, there’s stronger light but the daylength varies less so they plant “short-day” onions. It’s all of an uphill battle for the bulbing, in other words. I tend to plant 3 plantings: the one for the biggest bulbs starts way back under the lights in Feb., but I also plant rows directly in the garden in April and again in July. These little onions from these plantings will either become set onions next year or just small-headed eat-them-now onions through the winter in the greenhouse. Hope that helps: maybe that Candy onion just was planted at the wrong time in its cycle. Thanks for the tutorial! I’ve been eye-ing my Juane onions, who have far and away outdone my spanish and red, in terms of early growth, vigorous green parts and very sturdy stems. They are going to be good ones, I think. I’d like to save their seeds too so this gives me a good place to plan from when I stick them into storage for the winter. Your amazing! I was able to save over a few onions for seeding purposes but they certainly don’t look as good as those. I am trying Copra again this year, my last batch did not make it through until spring… perhaps this year. If I could just get some decent seed from my own onions I would be able get a better adapted plant and bulb for storage purposes. It’s that whole day length thing that is my biggest issue… only green onions like shade. You have most definitely mastered the allium. For now I will just have to be content to bask in your allium glory. 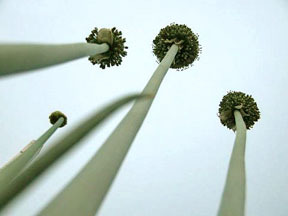 :) Seriously, we have learned a lot from your posts on alliums… thank you. El, your command of the allium family is impressive. But be careful. You could end up in the onion seed business. Excellent! Perhaps I’m speechless simply because the wine’s kicked in 🙂 I’ve never had a lot of luck growing onions other than “spring onions”….some day when I grow up. Or maybe they just don’t like all the rocks they have to compete with! Very interesting. Lately as all the planting has been going on, I’ve been wondering about some of the less-then-obvious seed/starting requirements. Seeds for pumpkins, squash, fruit, veg, I can find those everywhere, but I could never figure out how onions can be saved for planting/growing the next season. I planted a bit of spring onions this year with the garlic, and those are coming up with their greens in full force. This is helpful! I too find onions confusing. Some I’ve left in the ground for ages, others get huge in a wink. I’ve really got to think more carefully about these tasty bulbs! I’m a newbie seed saver and have been saving the easy seed for a couple of years now. The sweetest pepper, the juiciest tomato, the lettuce that refuses to bolt, but never onions. I’ve come to believe that I’m onion challenged, yet once again, you have not only convinced me to give it another try, but have supplied the knowledge to help me grow. On this one tho, I’m a little confused. I thought you couldn’t save seed from hybrids and regrow true to the parent. Petunia, what I also meant to say is leave a couple of the plants in the ground for over a year. As biennials, during their second spring they’ll work to form a seed head, which are quite pretty all on their own (but then again I use onion blossoms as my avatar so I am a touch biased). Let them bloom and dry a bit, then cut them, put them in a brown paper lunch bag, label the bag and save it until seedling season begins again. Christy, reds tend to be a bit more fussy and don’t keep as well (which is quite fine as they have their own merits). Pickled red onions are divine on a winter salad. I’ve heard great things about the Juanes too. Mike you are too kind. And see my comment to Ralokych below re: the Copras. But yes: sun is our vegetable companions’ friend, even if it’s not mine, particularly (as I am the biggest sun-wimp you will ever meet). Do try to grow some to seed, though; it’s very rewarding. Blaithin, I don’t know, not having rocks, but I do have tough clay soil; it’s nearly impossible to bury things in it. But don’t knock spring onions, they’re wonderful too. But yeah, maybe this means I am a grown-up? MC, leave one or two in the ground and watch what happens next year. It’s that easy. Much of my best gardening was borne of this certain type of neglect. AH, well, it was only once I started growing all we ate that I really began to get super-serious about onions. I had always been serious about garlic and leeks so onions, being the easiest thing I could get at my co-op, were 3rd tier, but now they’re not! Wow, Ralokych, you threw me for a loop so I had to go and check my garden records and indeed the Copra seeds from which these lovelies were grown were indeed hybrid seedlings I bought from Johnny’s 4 years ago when I toasted my first seedling tray of starts. I didn’t give them much thought, thinking that like the reds and the sweets they included in the 3-onion set, these were open-pollinated. So I don’t know what to tell you, except these were successfully saved and have held up better year to year than the open-pollinated Clear Dawn that I grew 3 years ago and have likewise been seed-saving. These two varieties have been crossed too with Clear Dawn coming true from seed. Maybe it’s just like seed-saving from years gone by: I am simply selecting for the longest-lasting, heaviest bulbs, an so it’s all just working out for me. Anyway, give it a try. I now grow 8 different onions for their seeds, each having different wonderful properties, and these were merely the long-keepers.